This information is intended for healthcare professionals only! ISSN 2409-2355 (Online), ISSN 2219-8202 (Print). The Journal is included in the List of scientific journals and publications of the Higher Attestation Commission (VAK). The Journal of Atherosclerosis and Dyslipidaemias was founded in 2010 as an official Journal of the Russian National Atherosclerosis Society (RNAS). Among our editors are the leading experts in the field of atherosclerosis and dyslipidaemias from different cities of Russia. The aims and scope of the title are in accordance to the aims and scope of RNAS: to make available for the wide range of researchers and practical clinicians the latest information about etiology, pathogenesis, diagnostics and treatment of atherosclerosis and dyslipidaemias. The journal contains research and review articles concerning latest findings in atherosclerosis and dyslipidaemias field. It is peer-reviewed, with multistage editing and is recommended by Higher Attestation Commission in Russia for publishing of major scientific results of research addressing PhD or other recognized medical degree theses defense. The language of publications is Russian, with abstracts of all articles presented in English as well. The circulation is 5000 of copies, 4 issues per year and distribution is free of charge. The Journal is free distributed by mail all over the Russian Federation, including medical universities and big medical centers. An electronic version is available on the website of RNAS (www.noatero.ru) and within the Russian Science Citation Index (www.elibrary.ru). Instructions for Authors should be used to prepare the manuscripts. 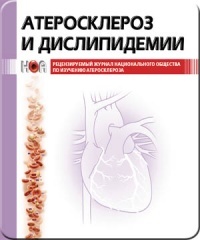 All manuscripts are to be submitted via the internet using www.noatero.ru website or by email to JAD_cardio@mail.ru.